In my Swedish 9-part survey (so far) on “Tacitus as a Witness to Jesus”, I have come to deal with the authenticity of the Christ-passage in Tacitus’ Annales. This blog post is basically a translation of the ninth post, Tacitus som Jesusvittne. Del 9 – Illustration på hur förlagan kan ha sett ut. As a proposal, I have suggested that the sentence “Auctor nominis eius Christus Tiberio imperitante per procuratorem Pontium Pilatum supplicio adfectus erat” (“Christ, from whom the name had its origin, was in the reign of Tiberius executed by procurator Pontius Pilatus”) could have been a later addition. I would not say that this is what I believe, yet I would like to show how it could have been done. 1) the word Christianos is replaced by Chrestianos, in accordance with what probably was in the original which the writer of M. II relied upon. 2) the sentence ”Auctor nominis eius Christus Tiberio imperitante per procuratorem Pontium Pilatum supplicio adfectus erat” is removed from the current text, in accordance with the hypothesis that Tacitus never wrote this. 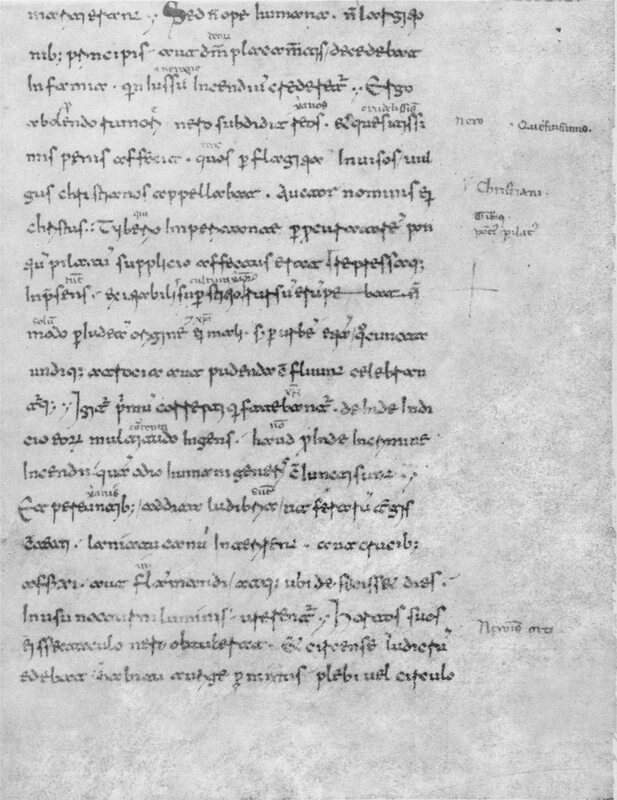 3) a text equivalent to ”Auctor nominis eius Christus Tiberio imperitante per procuratorem Pontium Pilatum supplicio adfectus erat” was created and inserted in the margin, in accordance with the theory that such a text only existed as a marginal note, a gloss, in the beginning, before it was inserted into the text when a new transcript was made of the manuscript. The images below are not meant to represent an accurate scientific rendering of how the text did appear, but mostly to serve as an illustration of the hypothesis. The images are used with permission. Montage and drawing (C) 2010, Dr. R. A. Daniel Pihl. The images can be opened in separate windows enlarged. A modified image of M.II, containing the Christus-passage. Montage and drawing (C) 2010, Dr. R. A. Daniel Pihl. Used with permission. Montage and drawing (C) 2010, Dr. R. A. Daniel Pihl. Used with permission. The theory then is, that this text was inserted in the current text as a new copy was made, and at the same time the words were also written more in full so that nois became nominis, xps became Christus, and so on. Below the unmodified image of M.II can be seen. The second Medicean Manuscript, unmodified. 1) The ”repressaque in praesens” (repressed for the moment) in the passage makes more sense if the Christus sentence was not a part of the original text, since traditional Christianity cannot have said to be repressed by the killing of Christ – quite the opposite! 2) Also, traditional Christianity cannot be said to have had its origin in Judaea. Probably the Chrestiani referred to some other, now unknown, Jewish messianic group, which would explain Tacitus’ use of the past tense (”chrestianos appellabat”, they WERE called chrestians) instead of the present form (”chrestianos appellat”, they ARE called chrestians). 3) If (and I mean only _if_) the Sulpicius Severus’ passage about the Christiani being involved in the first Jewish War, is from Tacitus, this would also indicate that some other group than the rather peaceful Pauline Christians, described by Pliny, are meant. 4) If the Christus sentence was a marginal gloss, this would also explain the discrepancy in the text – chrEstianos but chrIstus; the words would then have different sources – ”chrestianos” Tacitus and ”Christus” the marginal gloss. 5) It would also explain why Christians until (or for centuries after) Sulpicius Severus did not refer to the passage – it was not about them! 6) Pontius Pilate is in the Christus sentence mentioned as a procurator. No other Roman historian deemed it necessary to even mention Pilate, and therefore it is perhaps not plausible that Tacitus’ readers would know who he was. Christians of course did, and they called him procurator and not prefect (“Pontio Pilato, Syriam tunc ex parte Romana procuranti” – Tertullian, Apology XXI.18, “Pontius Pilatus procurator Judaeae a Tiberio mittitur” – Eusebius’ Chronicle in Jerome’s translation). The only “convincing” argument which I can see, for this sentence to have been authentic, except the fact that it is written in simple latin as were Tacitus’ texts, is that it is evident in the second Medicean manuscript (M.II). There would apparently though have been plenty of time for Christian scribes to insert the sentence until this MS was written in the 11th century.